you know how people of mixed race are always the most beautiful? namely halle berry, naya rivera, rashida jones, and zoe saldana, but the list goes on and on and on. 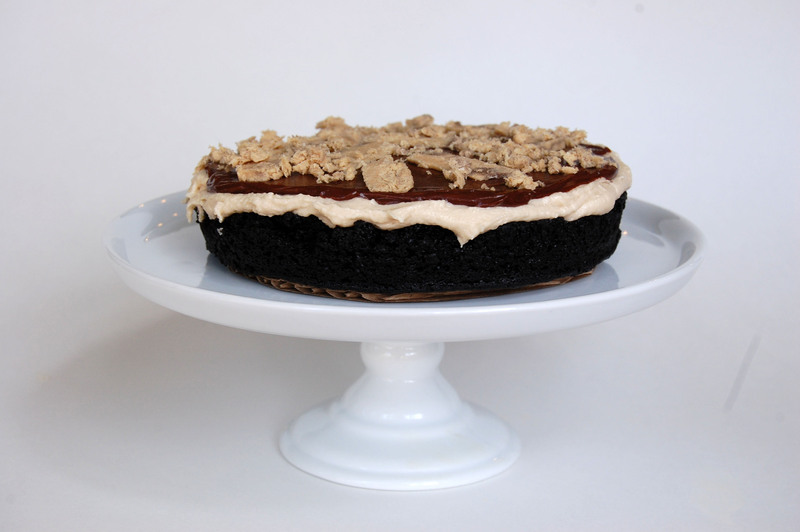 this flavorful hybrid of a cake falls into the same category. 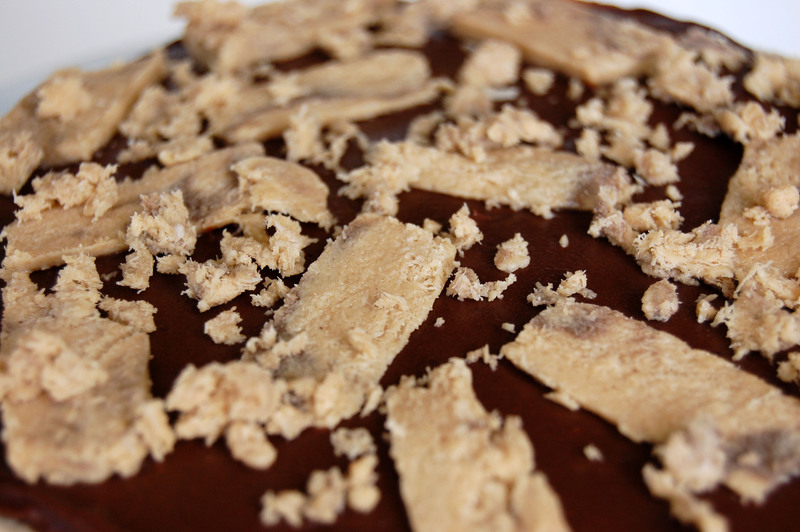 dark, damp chocolate cake is given a middle eastern kick with tahini, an oily paste made from toasted sesame seeds. savory-wise, tahini is the star of hummus and baba ghanoush, but it’s also the main component of crumbly, cloyingly sweet halva. sesame halva is popular across the Balkans, the Middle East, and throughout the Jewish world. 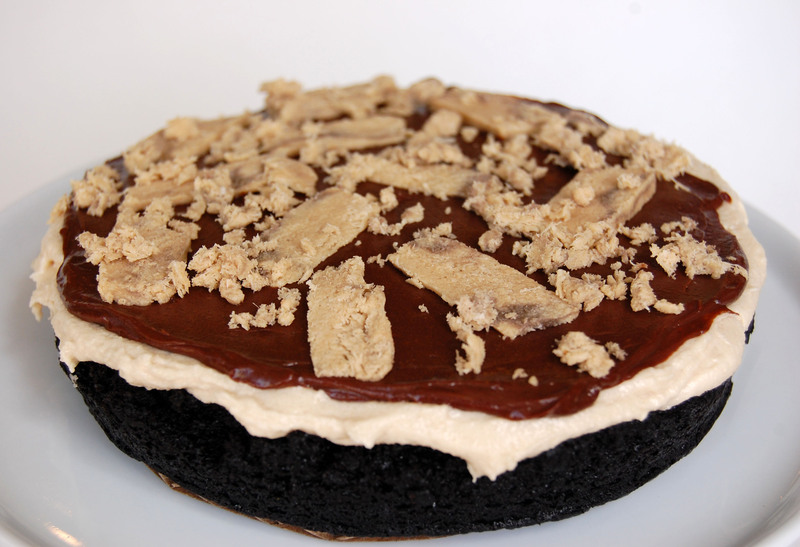 so we have moist sesame-spiked cake, topped with grainy brown sugar frosting, topped with intensely smooth chocolate ganache, topped with distinctly nutty marble halva. it shouldn’t work, but it does. for the cake, preheat oven to 300º. grease two six-inch cake pans and line with parchment paper. mix the chocolate with the hot coffee and set aside (don’t stir). whisk together the sugar, flour, cocoa powder, baking soda and powder, and salt. in a stand mixer, beat eggs until thick and lemon colored. add the oils, tahini, buttermilk, and vanilla. stir the chocolate-coffee mixture and add it to the wet ingredients. add the dry ingredients to the wet and beat for twenty seconds. divide evenly between the pans and bake for about 25 minutes – just keep an eye out and check it with toothpicks until they come out with a few moist crumbs attached. let cool for five minutes in the pan, then turn out onto a rack and let cool for at least an hour (or stick it in the freezer for 15 minutes). when cool, slice each layer in half horizontally. whisk together soak ingredients. 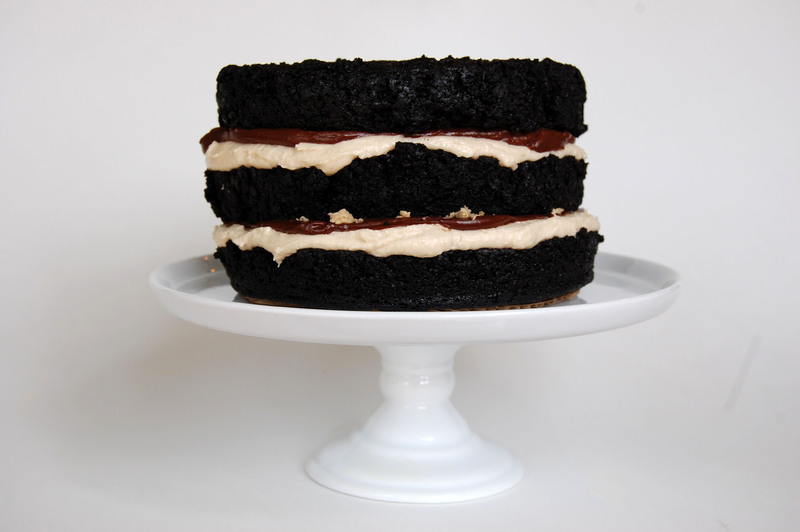 lightly brush the cut side of three of the cake layers with the soak (you won’t need the fourth layer). for the frosting, beat together the butter and brown sugar. beat in the cream cheese and powdered sugar. add tahini; beat for one more minute. for the ganache, put the chocolate into a heatproof bowl. heat the cream in a saucepan or the microwave until almost boiling, then pour over the chocolate. let sit for 5 minutes, then add butter and whisk until smooth. refrigerate for 10 minutes, or until thickened. to assemble, place one layer on a cake stand or serving tray. spread almost to the edge with frosting, then spread ganache almost to the edge of the frosting (you should be able to see about 1/2 an inch of frosting). top evenly with half of the halva. repeat. end with the third cake layer. i left mine naked, because it was super wobbly, but feel free to add rosettes, sesame seeds, or a drizzle of ganache! Wow this is really unique and sounds awesome, did you come up with it yourself?